Indonesia AirAsia Flight 8501 (registered PK-ACX) was a scheduled passenger flight from Surabaya, Indonesia to Singapore. The aircraft was an Airbus A320-216 (using CFM56 engines) and it went missing over the Java Sea on 28th December 2014 carrying 155 passengers and 7 crew on board. Records released soon after the aircraft went missing show that the A320 first flew in 2008 and had a full maintenance check last month. AirAsia is a low-cost budget airline based in Kuala Lumpur, Malaysia. The company was founded in 1993 and this is its first ever suspected hull loss. The accident is the third in 2014 involving a Malaysian airline or its affiliate following the loss of Malaysia Airlines Flights 370 and 17. The flight took off from Juanda International Airport, Surabaya, at 05:35 Western Indonesian Time (WIT) and was due to arrive at Singapore Changi Airport at 08:30 Singapore Standard Time (SGT), with a flight time of less than 2 hours. The plane was under Indonesian air traffic control when the crew requested to deviate from its original flight path due to heavy tropical storm fronts at 06.13 (WIT). This was the last radio communication Indonesian ATC had with the crew of QZ8501. The area where the aircraft went missing is part of the Inter Tropical Convergence Zone (ITCZ). As part of the flight deviation, the pilot requested a slight left heading change and an assent from FL320 (32,000 ft) to FL380. Storm clouds in the area reached up to 50-53,000 ft.
ATC lost radar contact with QZ8501 at 06:17 WIB, though there are conflicting reports when exactly radar contact was lost or last seen. Some reports have referenced 06.24 (WIT). There was also an initial report that the aircraft's ADS-B (Automatic Dependent Surveillance – Broadcast) was still sending positioning data via satellite for up to 30 minutes after it went missing. There is some concern at the speed of QZ8501 at the time of its ascent to FL380. Flight radar released after its disappearance shows a speed of 353knts at an altitude of 36,300 considerably slower than a similar flight in the area flying at FL360. 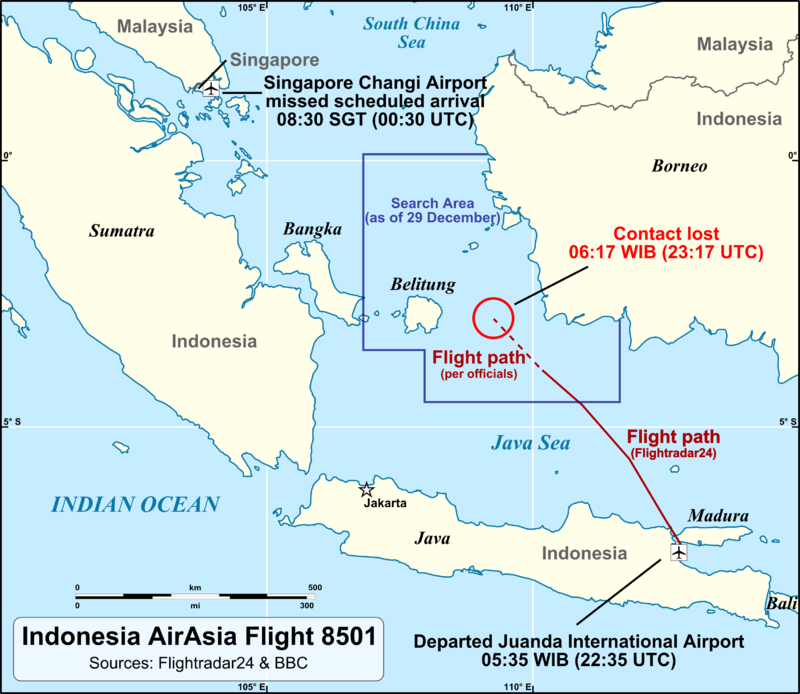 The flight crew did not send any distress signal during any communications with Indonesian ATC. Captain Iriyanto had a total of 20,537 flying hours (of which 6,100 flying hours were with AirAsia Indonesia on the Airbus A320). The First Officer was Rémi Emmanuel Plesel, who had a total of 2,275 flying hours with AirAsia Indonesia. Curiously, this short haul flight also had a Flight Engineer on board, Saiful Rakhmad. It is not clear if Rakhmad was actually in the cockpit for the flight. The aircraft was officially declared missing at 07.55 (WIT). Indonesia's National Search and Rescue Agency deployed seven ships and two helicopters to search the shores of Belitung and Kalimantan. The Indonesian Navy and the provincial Indonesian National Police Air and Water Unit each sent out search and rescue teams. In addition, an Indonesian Air Force Boeing 737 reconnaissance aircraft was dispatched to the last known location of the airliner (3.2466°S 109.3682°E). The Indonesian Navy confirmed that it had dispatched four ships by the end of the first search day, joining the initial search efforts. Further aircraft, among them, a CASA/IPTN CN-235, have also joined from the Indonesian Air Force. The Indonesian Army deployed ground troops to search the shores and mountains of adjacent islands. Singapore's Rescue Coordination Centre (RCC), managed by the Civil Aviation Authority of Singapore (CAAS) and supported by various agencies, including the Republic of Singapore Air Force (RSAF), has also initially deployed a C-130 Hercules aircraft to aid in the search and rescue operation. An officer from Singapore will be deployed to Jakarta to coordinate with the Indonesian authorities on the search operations, and two more C-130 Hercules aircraft will be deployed for the second day of the search and rescue operation. Malaysia's government has also set up a rescue coordination center at Subang and has deployed three military vessels and three aircraft, including a C-130 Hercules, to assist in search and rescue operation. Air search operations were suspended on the evening of December 28th due to darkness and resumed at 05.00 (WIT) on Monday, December 29th. On 28th December 2014, the day of the disappearance, a fisherman observed some debris, small and large, near Pulau Tujuh. The largest piece was 4 metres long and 2 metres wide. They were red coloured with white silver. He only reported this the following evening, after he had returned home and heard of the incident. Another fisherman reported that, while moored on Sunday at Pulau Senggora, south of the town of Pangkalan Bun in Central Kalimantan, at 7am, he heard a loud booming sound. His friends say they saw a plane from above Pulau Senggaro heading towards the sea. The plane was said to be flying relatively low before it disappeared from view. The fishermen's reports, delivered the next day, were credited with guiding the search and rescue team to the vicinity of the first debris found. On 30th December, a rear exit door and an emergency slide (which was not inflated) were spotted by search aircraft, initially reported as 10 kilometres (6.2 miles) from where the plane last contacted air traffic control. However, subsequent reports later released say the debris was found up to 60 miles from the last radar location. Indonesian authorities later confirmed that the another piece of the airframe and a maintenance case (used to hold replacement items such as light bulbs and fuses) had been recovered. Also on 30th December, Indonesia's Search and Rescue Services reported that the wreckage of the aircraft had been located on the Java Sea floor, 97–100 nautical miles (180–185 km) southwest of Pangkalan Bun. The fuselage had broken up into several large parts but was still easily recognizable as the aircraft. The next day, the head of the Search and Rescue service denied that they had confirmation that the fuselage had been found. On 31st December, the Wall Street Journal, citing BASARNAS, claimed that a sonar image obtained 30th December by an Indonesian naval ship appears to show an aircraft upside-down on the seafloor in about 24–30 metres (80–100 ft) of water, approximately 3.2–3.5 km (2.0–2.2 miles) from the debris found on 30th December. The head of the Search and Rescue service continued to deny the existence of any sonar images of the wreckage. On January 1st 2015, the first victim recovered from AirAsia Flight QZ8501, found in the Java sea on Sunday December 28th was named and buried in her hometown in Surabaya. She was identified as school teacher Hayati Lutfiah Hamid. Ms Hamid, 49, was officially listed as seated in seat 23B towards the final third of the aircraft. All the objects so far located at this point have come from the rear of the aircraft. By January 1st 2015, a total of 9 bodies had been recovered. Poor daylight weather continues to hamper recover of bodies from the sea and search divers accessing the fuselage of the aircraft. The weather has also restricted the operations of helicopter support. There are now 90 sea vessels, official and private boats, in the search area. At a press conference given on the morning of 3rd January by the Search and Rescue Agency (Basarnas), the discovery of two large submerged objects was reported. One object measures 9.4m x 4.8m x 0.4m, and another thin object measures 7.2m x 0.5m. Later in the day Basarnas reported up to 4 objects with the largest largest being 18m x 5.4m x 2.2m located at -3,9241948673 110,5252477224. So far 34 bodies have been found with 6 identified. The passenger manifest shows that the identified passengers came from various areas of the aircraft. It was hoped to send divers down equipped with cameras to take a closer look at the aircraft wreckage but poor weather and visibility has delayed divers. 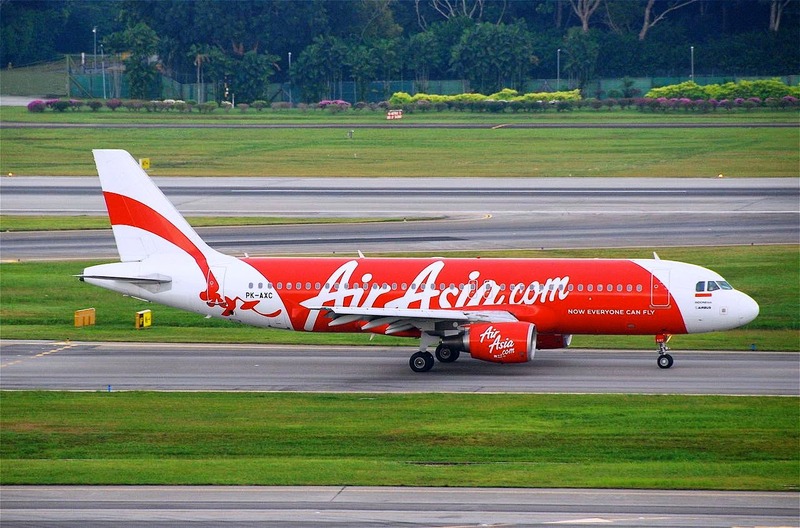 Separately, the Indonesian Ministry of Transport has suspended the route licence for Air Asia on the Surabaya-Singapore route when it was disclosed that the airline has exceeded route limitations by flying on Sunday with a route permit which did not allow this. At a press conference given on 7th January, Basarnas, the Search & Rescue Agency confirmed that divers had identified a piece of wreckage 30km (19 miles) from the initial search area as the tail of flight QZ8501. A total of 41 bodies have been recovered from the Java Sea, of which 24 have been successfully identified. Searchers and investigators now believe that the bodies of the majority of remaining passengers may still be within the main fuselage. Currently, there are 59 bodies recovered, with 47 identified. On Friday, January 23rd, divers and search vessels will attempt to raise the main fuselage using very large inflatable underwater balloons. Searchers over the past two days have recovered both the data and cockpit voice recorders and are currently extracting the data for examination. While full examination of the flight data recorder may take a couple of weeks to fully analyse, investigators are confident that they should have clear indications of what happened on AirAsia Flight QZ8501 within the next few days. A preliminary report from Indonesian officials is expected in February. QZ8501 infographic via Reuters based on data released by the Indonesian Ministry of Transport and investigators. 06.12 - QZ8501 request an ascent to FL380 from their current FL320 due to a weather front ahead. That's a big ask for any pilot when they have already adopted the flight's cruising altitude. 06.12 - Climb request is denied by ATC due to traffic above them and asked to 'STANDBY' for further instruction. It will be interesting if the information released next Wednesday from the non-public preliminary report discloses what communication ATC had with other traffic over the next two minutes as they try to clear an ascent for QZ8501. There have been reports in the media that Indonesian ATC is sometimes slow to respond to requests of course and altitude changes in their airspace. I've seen one media report delays of up to 25 mins. I think some of these media reports are mischievous because I've seen no evidence of it. The information already available means it certainly DID NOT happen in this case. 06.14 - ATC grant QZ8501 an ascent from FL320 to FL340. There is no response or confirmation of ATC instruction from QZ8501. 06.17 - ATC have now tried 8 times to get confirmation of their last instruction to QZ850 in the space of three minutes. 06.17 - ATC formally declares radio contact with QZ8501 lost. Again, it will be interesting to see what procedure ATC followed at this point. 06.17 (09 secs) - QZ8501 is tracked climbing 300ft in 6 seconds. I don't see anything untoward here, as such. It could have been an updraft, or the cockpit crew now acting on the instruction to climb to FL340, but too busy struggling with an aircraft in difficult conditions. Pilots are trained to control first, then communicate. 06.17 (24 secs) - QZ8501 is tracked climbing 1700ft in 6 seconds. I'm not a radar expert, but the 6 seconds bursts are lightly the radar screen updating with the latest information on the movement of the aircraft. Some of this information is also likely coming from the parameters taken from the Flight Data Recorder recovered. 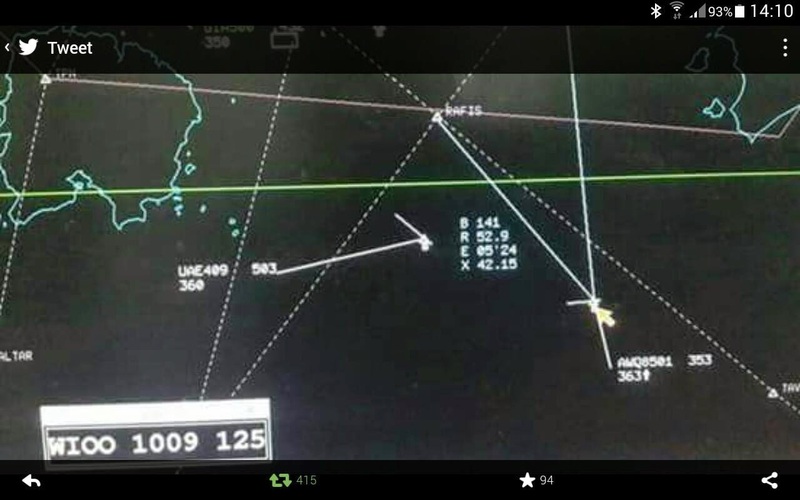 The dramatic climb would have alerted ATC that something isn't right with QZ8501.The ascent is abnormal. It should be steady and gradual. 06.17 (41 secs) - QZ8501 is now at FL360, 2000ft above the advised level from ATC, and 4000ft above its original flight level. The information so far revealed is not exactly clear on WHEN QZ8501 started ascending. The data would suggest it coincided around 06.14 when ATC cleared it to climb but the crew didn't respond and confirm. But I would still like to see data confirming when exactly QZ8501 began climbing - before or after ATC's instruction. 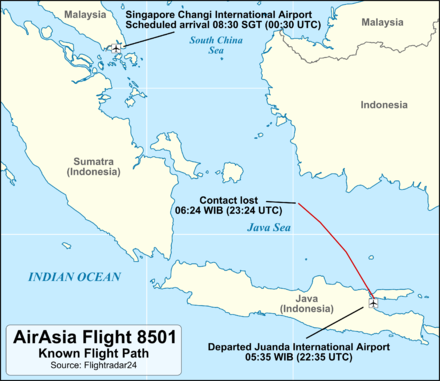 06.17 (54 secs) - QZ8501 is now tracked at FL376. It ascended another 1600ft in 13 seconds. Aircrafts like the Airbus 320 climb normally about 1000-1500ft per minute. If QZ8501 started ascending at 06.14, then it should normally have been at 3000-4500ft above FL320 (FL350 to FL365). It's the bursts of climb in a short space of time that concern me, not the actual altitude the aircraft reached. Yes, the crew have breached the flight level advised, but pilots have to deal with the situation they are in, and the climb is not just about the rate of ascent, but the attitude (angle of ascent) and speed the aircraft was travelling at. If QZ8501 started ascending instead at 06.12, right at the time it requested FL380 due to weather conditions, then the rate of ascent is not nearly as odd as first noted. The real rate of ascent vs speed and capabilities of the A320s climb ceiling of QZ8501 can only be ascertained is if the investigators reveal the parameters from the FDR. Only then we will know if QZ8501 was climbing way outside the recommended capabilities of the A320. But the greater questions here are why the flight crew attempted a steep climb above a storm front in the area rising to 50,000-53,000ft, how briefed were they on what lay ahead, and was their A320 giving them the correct airspeed and attitude of the aircraft. Accidents like this are normally due to a combination of events, never just one, and I don't believe weather alone took this aircraft down. 06.18 - QZ8501 is now in descent. The aircraft has dropped 1500ft in 6 seconds. It will continue to reach a fall rate of 7900ft per minute. That kind of descent will alert the STALL warning and it's likely the warning was already sounding in the cockpit long before the aircraft actually began to fall. This is a strong indication of engine flame out (the engines simply can't function anymore with the rate of previous ascent and attitude of the aircraft). There will also be other master control warnings sounding and flashing in the cockpit to do with speed and engine failure. The aircraft FMS (Flight Management System), which controls the various auto-pilots, will have already handed back critical manual control of the aircraft). It simply cannot deal with the 10s, probably hundreds, of error warnings in the system. 06.18 - QZ8501's descent is so rapid, radar loses tracking of it at FL240. The aircraft's descent from FL376 likely lasted nothing more than 2 to 3 minutes. There is simply no time to alert the passenger cabin staff to a water impact. And, yet, somehow, the captain of this aircraft somehow managed to clearly wrestle back some control. The debris site and condition of the main fuselage suggests some attempt to put the aircraft in the water in a lateral position, rather than nose-in, which is devastating on impact. The tail broke off first, whether due to tail-in impact with the surface of the Java sea, or the tail literally breaking off with the high rate of descent. The first recovered debris came from the rear of the aircraft - a maintenance case kept in the rear tail; the first bodies from the rear; an emergency rear door blown outwards on breakup or impact or shortly before the aircraft impacted; the evacuation inflation raft on the rear door was not inflated; and the unit to activate inflation was also recovered. Weather has not been great in the Java sea over the past two days, but efforts are on-going to refloat the main fuselage tomorrow with large inflatable air bags. 5 bodies were recovered today close to the main fuselage, still strapped to their seats, and without life jackets. Let's us hope all victims of QZ8501 are finally returned to their families where they belong. And let us hope that QZ8501, while our skies are often the safest places to be than the road to the airport, that we refrain from finger-pointing and fix the things that need to be addressed in the aviation industry. 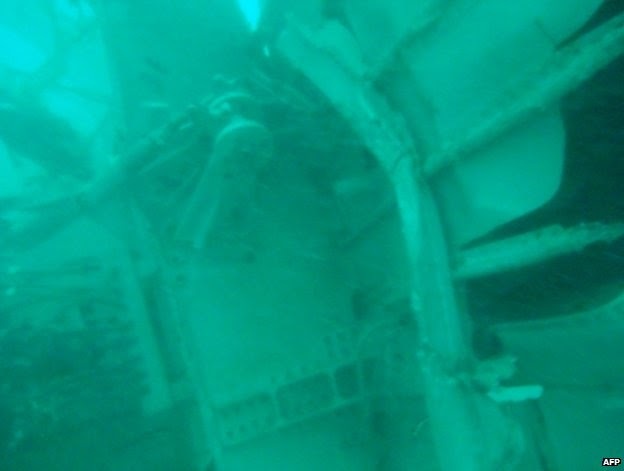 Following three successive failures to lift and recover the main piece of fuselage, the Indonesian military announced that it was withdrawing its assets from the search and recovery, concluding that the fuselage was too fragile to be lifted any more and that divers were satisfied that no more bodies were contained within it. The SAR (Search & Rescue) team suspended the operation for several days and restarted it on Saturday, January 31st with the priority to focus on the recovery of all bodies and access the cockpit of the aircraft. So far 75 bodies have been recovered with 64 identified. During a press conference on January 29th, the Indonesian NTSC noted that they were examining a number of factors and that the First Officer Rémi Emmanuel Plesel was flying the aircraft and Captain Iriyanto was monitoring the flight and carrying out radio communications. Since the release of the preliminary report to the ICAO a number of news media have reported 'from sources close to the investigation' that the investigation is focussed on a possible malfunction of the Flight Augmentation Computer (FAC), which had caused problems on previous flights over the period of a week. Investigators are examining if either pilot reset of switched off the FAC. Two erroneous articles by Bloomberg, and soon after Reuters, wrongly cited 'sources close to the investigation' as reporting that Captain Iriyanto left his seat and pulled circuit breakers behind the cockpit which controlled power to the primary and backup FACs. The FAC is the part of the Fly-by-wire system in an A320 aircraft responsible for rudder control and ensuring that pilots do not exceed the flying limits of the aircraft. On Sunday February 2nd, the Indonesian NTSB refuted reports in the media that Captain Iriyanto left his seat. So far 101 bodies have been recovered from the Java Sea with 86 identified. The chief of Indonesian Search and Rescue indicated that the recovery of more bodies could be halted if no more are found in the coming days. While only 106 bodies of the 162 on board flight QZ8501 have been recovered from the Java Sea, it is expected that officials in Indonesia will end the official search in the next 24 hours. Much of the wreckage of ill-fated Air Asia Airbus A320 has now been recovered and is currently being examined by investigators. 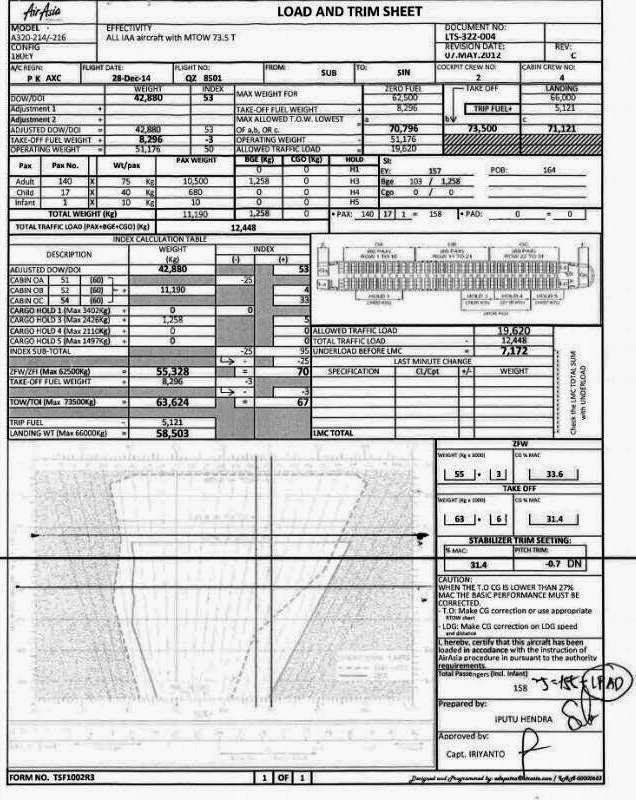 The NTSC published its final report on QZ8501 citing an electrical solder joint in the rudder system in combination with how the pilots dealt with the emergency. The report stated that the sequence of events that led to the crash started with a malfunction in two of the plane’s rudder travel limiter units and that the pilots had "done everything they could". A tiny soldered electrical connection in the rudder-travel limiter unit was found to be cracked, causing it to send four warning signals to the pilots. The crew's attempt to fix the problem by resetting the flight management system also disengaged the autopilot, which contributed to the subsequent loss of control. While the crew were required to fly the Airbus A320-200 manually, there was a nine second delay between the start of the roll and pilot control. The report did not not specifically conclude that pilot error caused the crash while detailing the chain of events leading to the loss of Flight 8501. However, one of the investigators, the NTSC's Nurcahyo Utomo, referred to an apparent loss of communication between the pilots (based on the cockpit recorder) and said that the malfunction should not have led to a total loss of control had they followed the recommended procedure. Specifically, the report states, "Subsequent flight crew action resulted in inability to control the aircraft... causing the aircraft to depart from the normal flight envelope and enter a prolonged stall condition that was beyond the capability of the flight crew to recover". The Committee added that the rudder travel limiter units had been repaired at least 23 times in the 12 months prior to the crash, and the last malfunction led to a 104-degree roll (while the limit is set at 33 degrees). French First Officer Rémi Emmanuel Plesel was reportedly at the controls just before the accident when a stall warning sounded in the cockpit indicating that the jet had lost lift. One of the officers pulled the circuit breaker of the Flight Augmentation Computer (FAC), which is usually prohibited during flight. The FAC is the part of the fly-by-wire system in A320 aircraft responsible for controlling flight surfaces including the rudder. Without the FAC's computerized flight augmentation, pilots would have to "rely on manual flying skills that are often stretched during a sudden airborne emergency". I found the blog content very useful and informative, I am sure it will really help me a lot . Thank you, really appreciate it from the bottom of my heart. If you want essay related topic you can take online essay writing service help through custom essay writing service before the exam.